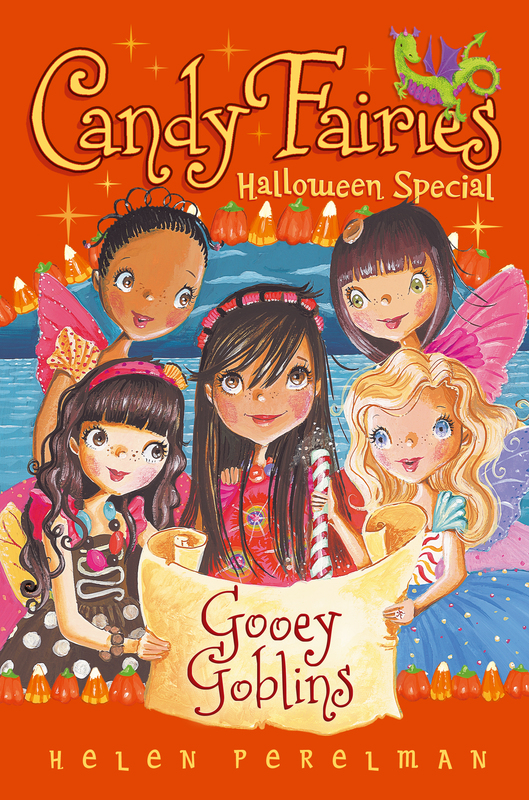 This Halloween-themed Candy Fairies super special has double the delicious fun! In this extra-long Candy Fairies adventure, five fairy friends are sent on a quest to discover why all the gummy trees are melting in the Sugar Valley. Is a goblin haunting the Gummy Forest? Each fairy will need to use her unique abilities to discover what is souring the forest. Turns out, it’s a sad, lonely young dragon named Carobee. But with some help from the Candy Fairies, Carobee learns to spin his fire into a special sweet treat, so peace can be restored to the kingdom. “Look, there’s Dash!” Cocoa called. As the three fairy friends neared Peppermint Grove, they saw their tiny friend Dash shooting up to meet them. “And yet she still had time to put on her best sugar-jewel necklace,” Cocoa added with a sly grin. “Just because I was rushing doesn’t mean I have to look sloppy,” Berry replied. Berry always liked to look her best and was usually sporting a new piece of jewelry that she had made herself from sparkling sugarcoated fruit chews. “What do you think this is all about?” Melli asked. She was worried about her friend Raina the Gummy Fairy. Usually Raina didn’t overreact to situations. She was very calm and always followed the rules. “Maybe she just couldn’t find something in the Fairy Code Book and needs our help,” Cocoa joked. “No, there’s definitely something strange blowing around the valley,” Dash said. She looked back at her friends. “And no, it’s not just the cold autumn wind,” she added. “No wonder she called us,” Berry whispered. “Let’s go find her,” Dash said. “I never thought I would say this,” Dash said, “but Gummy Forest is a melted mess!” She flew over a rainbow puddle. Even though Dash was the smallest of all the Candy Fairies, she was always hungry and was the most adventurous eater. If the melted gummies didn’t appeal even to Dash, the fairies knew things were really bad. “Are you okay?” Cocoa asked. She put her arm around Raina. “I told you something was going on,” Dash mumbled. “The gummy flowers over by Chocolate River did look melted,” Cocoa told Raina. Dash’s silver wings flapped nervously as she spoke. “Last night I heard howling and moaning in Peppermint Grove,” she whispered. Melli gasped, and her hand flew up to her mouth. “If Princess Lolli is calling us to the castle, the situation has to be sour!” Dash exclaimed. “Not necessarily,” Cocoa said, trying to keep her friends calm. But in her heart she wasn’t so sure. Princess Lolli was the kind and gentle ruler of all of Sugar Valley. She didn’t often call a meeting of all the fairies—unless something was very urgent. The fairies flew off to Candy Castle hoping that all would soon be right in Sugar Valley.